The meaning of the word "Vreugde" is joy or happiness and that is exactly what the owners of Vreugde Guest Farm strive to offer their guests. A winner of the Hospitality Association of Namibia (HAN) Golden Award for five years, the staff at “Vreugde” endeavour to provide a friendly welcome and high quality, personalised service at an affordable price. Situated in the heart of Namibia, just 30 minutes drive from the Etosha National Park's Anderson Gate, “Vreugde” is a perfect stop-over where you can sit back and relax, and recapture the beauty that you have experienced on your travels through our vast and beautiful country. Come and enjoy the peaceful tranquility as you relax in our beautiful, shady garden, while your hosts take care of your every need. 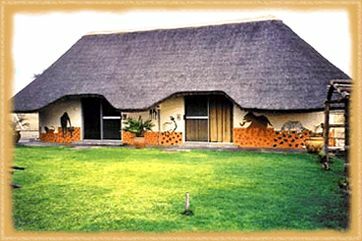 “Vreugde” offers accommodation in 1 double room, 5 twin rooms and 1 family guest room, all en-suite. Two rooms are also available for guides. Activities on offer include guided day-trips to Etosha in an open vehicle, farm-drives, sun-downer drives, guided walks, and guided day-trips to other sites of interest, such as Fingerklip and Twyfelfontein. But your guide will always ensure you are back in time to experience the sunset over the bushveld of "Vreugde"!